Overtreatment with L-thyroxine causes deleterious effect on health. There is lack of data regarding management of massive thyroxine overdosage. 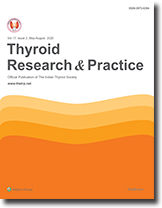 We report a case of a case of massive L-thyroxine ingestion leading to factitious thyrotoxicosis. A 34 year old female, known case of hypothyroidism on L-thyroxine for past few years presented with history of ingestion of 100 tablets of L-thyroxine 100 meg. She came to hospital after 8 hours of drug ingestion. She was delirious and had severe tachycardia on presentation. Her pulses were feeble and her BP was 90/60 mm of Hg. She was admitted in critical care unit. Serum Thyroxine was > 30 mcg/dL and S. K+ was 3.4 mmol/L. She was treated conservatively with IV fluids, steroid, potassium replacement and beta blockers. She was discharged after 7 days of hospitalization. Her T 3 /T 4 levels normalized on Day 14.